The day has finally arrived for me to launch my first three products in the RasPiO® range. What’s RasPiO®? I hear you ask? 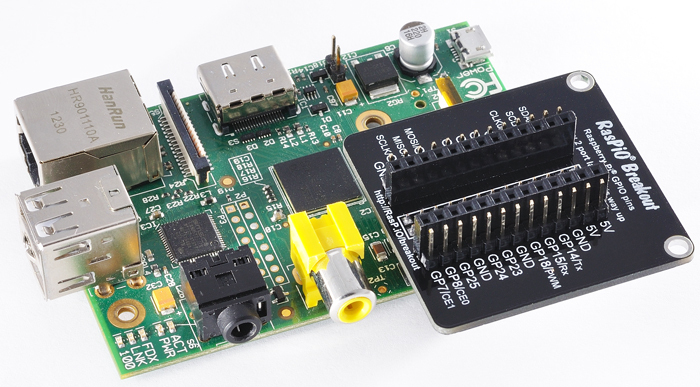 It’s a family of add-on boards for the Raspberry Pi®. It’s pronounced “Razz-Pie-Oh” (emphasis on Pi) and is derived from the fact that the boards will mostly be I/O (input-output) boards for the Raspberry Pi. A simple port labels board with large, clear labels, with GPIO numbers on one side and Alt functions on the other. It also makes an attractive key-fob. A Breakout board with large clear labels, that breaks out each port twice, giving you the opportunity to connect either male or female wires to any port. It also allows you to detach the Pi from your project without ruining all the wiring. RasPiO® Breakout pro does everything RasPiO® Breakout can do, but also has protection circuitry on every port, to help protect your Pi from wiring errors. For full information on any of the three products, click a link below. There are some more videos on the RasPiO® Breakout Pro page. Do these come with the pin headers or do you have to buy them yourself? …with both of the breakout boards. Neat little boards, and for a fair price too. For some reason the Cyntech pages are linking to “https://rasp.io/ports/%20%E2%80%8E” which is obviously an incorrect URL! Thanks. I think that was a cut and paste issue, but I hope it’s fixed now. Yes there will be some at the next CamJam in May. for two breakout board (10£) the shipping cost is 13£ for shipping in canada…. for two pi case plus camera mount(20USD), it cost me 9USD shipping via royal air mail on modmypi..
meanwhile I will monitor their website. To be honest, I don’t know. Hopefully soon. Adafruit aren’t stocking these at the moment, but I have asked them if they’d like to. It must have been another product you saw there. Thanks for an excellent product, I’m sure there is much more enjoyment to come! Nice photos there Steve. Looks like your soldering skills returned pretty quickly. Hope you enjoy your RasPiO Breakout Pro. Do you have a distributor in the US? Several have expressed interest but none have yet placed an order as far as I know. Best contact Cyntech. Dave.Mellor@ cyntech.co.UK to talk about that. One thing. I have seen a number of pin identifiers now. For the B and previous to the B+ the board should either have more holes or be cut off so the B+ pinout can be accommodated. I used a saw. The other thing I have seen is slip on breakout boards and serial boards that take the serial pins away from the HAT space. (Using compression fit like backplanes.) No criticism just observation of the space for these items. These were all launched a year ago before the B+ was even known about. There is a new port label for the B+ (July 2014) and will soon be one with Pi2 and A+ on it with an improved silk-screen.